I believe it’s most definitely an understatement to say that conspiracy theories about secret government projects are abundant. This is even more true considering that the Internet exists and spreads a lot of these theories and rumors through blogs, emails, and other outlets every day. But it certainly is fun to think about the possibilities, and even consider the possibilities that something very interesting indeed might have been going on. Headed to Long Island this week for the interesting, possibly fictional, story of the Montauk Project. Montauk Air Force Base is abandoned and has not been used for quite some time now, since 1981. This may sound quite mysterious unless you know that it’s now known as Camp Hero State Park and seems to be quite lovely. Its past remains, however, in this structure still remaining there. According to the story, now widely spread but possibly originating from a Mr. Preston Nichols, the Montauk Project focused on psychological warfare and time travel. (See Wikipedia.) He even wrote a book about it, connecting the Montauk Project to the Philadelphia Experiment. It’s fairly easy to believe that he made up a fantastic story. The government’s tendency to keep things classified (and Montauk’s radar role in the Cold War) means that we aren’t likely to get the real story any time soon, if at all. So. Could the government have had a secret project going on in Montauk, all those years ago? Possibly. Certainly, if you start with the fact that the government just simply keeps things classified anyway. That fact, however, doesn’t stop the theories and stories and the inventions of our very imaginative human minds. 1. Oliver Peterson, “Camp Hero and the Montauk Mystery,” Dan’s Papers, June 5, 2014, http://www.danspapers.com/2014/06/camp-hero-and-the-montauk-project-mystery/. 2. Aaron Sakulich, “The Montauk Project,” The Iron Skeptic, accessed February 6, 2016, http://www.theironskeptic.com/articles/montauk/montauk.htm. What’s that smoke rising above the swamp? Has the peat caught fire, or is something very strange going on here? We’re heading down to Florida with the tale of the Wakulla Volcano. Florida is a pretty cool place. It contains the oldest city in America, offers a lot of vacation options, and has a climate that allows people to take advantage of those vacations pretty much year-round. It also has no shortage of swampland. Swamps are fascinating. They’re deep and dim and mysterious. Swamps capture the imagination, because they are places where interesting things can hide. And Florida’s swamps may have once hidden something very interesting indeed. Smoke and what might have been flame were being seen in Wacissa Swamp, but in 1840, it was no new thing. Legend says the Seminole people had seen it for years, this smoke that seemed to have some mysterious source. What could have been burning this much to be visible from Tallahassee and even the Gulf of Mexico? A camp, maybe, inhabited by anyone from pirates to escaped slaves? It was 1865 before the mysterious sight was called a volcano. And from what I can tell, it did indeed appear to be one. What else would smoke and a bright glow be, to be seen that far away without being a widespread and deadly fire? And it isn’t as if Florida is a dry part of the country. A little later, in the 1870s, the theory that it might simply be a geyser or hot spring came about, but those would not negate the possibility of a volcano. A New York Herald expedition sent to find it was unsuccessful, to say the least, because the volcano was never found and the man sent from the paper died. It probably seemed that this phenomenon would be a part of life in Florida for a while. Until August 31, 1886, the day an earthquake hit Charleston SC. An interesting thing about earthquakes on the east coast is that, for geological reasons, the tremors are felt quite far away. In this case, Lake Jackson in Florida drained (which isn’t unusual for that particular lake). After the earthquake, according to the story, the Wakulla Volcano disappeared. Of course, there are reports at this point that conflict. Other accounts say that the smoke returned in the 1890s. And then come the later stories, of evidence that could only have been left by a volcano. Of course, there is also the possibility that this was all very simply a peat fire. But what if it wasn’t something so simple? Why would an earthquake have shut it off, only for it to reappear a few years later? Was a peat fire burning, or was it being maintained? Could the Wakulla Volcano have a perfectly rational explanation that is still different from the current theories? I encourage you to look into the Wakulla Volcano. I got this idea from Weird US, but there are plenty of sources out there. The Wakulla Volcano seems to have been certainly something to see, and the true explanation might be something we never expected. Does the strange flying creature have a normal explanation, or is something else going on here? This week, we’re heading north to West Virginia, looking out for glowing eyes in the sky and a winged individual who’s taken a place in American lore. The facts seem to be pretty straightforward with regards to the events surrounding the appearances of the Mothman. It all began on November 12, 1966, in a Clendenin West Virginia graveyard. Five men were on the task of digging a grave that night, when something strange happened. Someone flew by overhead, clearly a man with a distinguishing feature: wings. Whoever he might have been, he stuck around for a few days. I twas on November 15, 1966, when he was seen again. This time, the Mothman chose an old TNT plant in Point Pleasant, West Virginia. The witnesses this time were four friends driving together near the plant, wings on his back and eyes glowing. Whoever he was, he moved with an unnatural speed, somehow managing to keep up with the car when the driver sped up. There were other sightings, one in which he terrorized a woman outside of her car. Of course they called the police. Wouldn’t you? The next year, on December 15, 1967, the Silver Bridge collapsed into the Ohio River. The mysterious Mothman, was linked to the tragedy, mostly because he wasn’t seen again. Perhaps you wonder why I am using “who” and “he” as though there might be some ordinary explanation available. That’s because I believe there is. Certainly, the legend of the Mothman is strange and colorful and a little spooky. The idea of his possibly otherworldly origin feeds the imagination. But what if it was just a man? What if the Mothman was just some guy trying out a glider? What if his eyes didn’t glow? Even if they did seem to do so, what if that had an explanation based firmly on Earth? It’s interesting to consider the possibility. That Mothman was there all along. That he was a neighbor, with an unusual hobby, and maybe a thick pair of glasses. Perhaps it’s a strange curiosity you see along a new route you travel, or maybe you’ve passed it many times, but never enough for your brain to quite reconcile the utter oddness of those pieces left behind in such strange ways. I can’t say that it is only one place that has me thinking of this topic. There are a few places I know well enough that it caused me to take a little more notice of lonely chimneys and a random houseless stoop that borders a sidewalk. It’s also not uncommon, here in the South at least, to see the side of an old barn or even an old house peeking through trees, the structures left to fall apart on their own. They usually do, if they aren’t simply torn down by the owner. 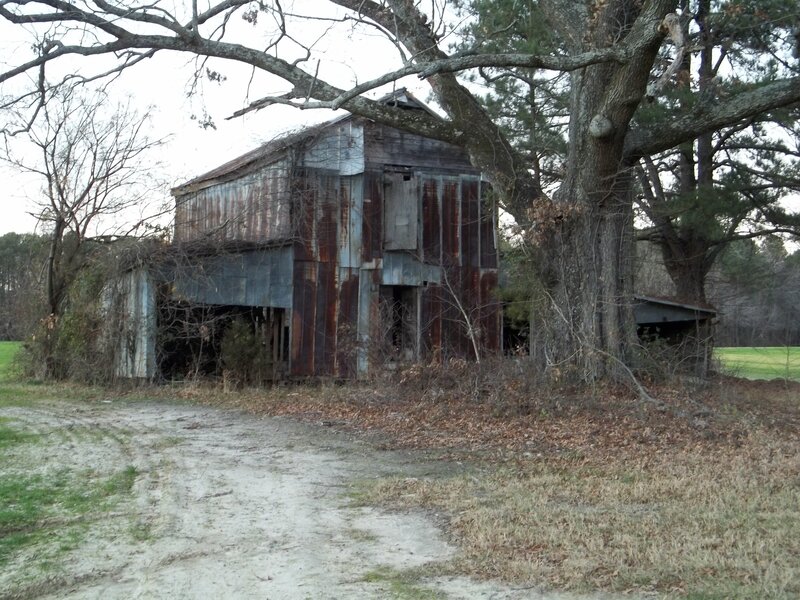 This barn once stood in Wilson County. It has since been torn down or fell on its own, though the land is still actively farmed. The latter do not concern me all that much. What really gets me interested are the places such as I’ve seen near South Hill, VA. There is one spot I’ve passed there before where there are two chimneys (or perhaps one) and no house beside. In another town, quite literally, there are three steps leading into an empty lot. A place once dwelt in. I believe (and I may be getting the exact location wrong, though I have seen this) that on the road between Wilson NC and Raleigh NC, if you go through Knightdale, there is a single, small stone structure that appears to have been a fireplace. What are these places? Of course, they were once homes, but why was so much erased, only for tiny pieces to be left? Were they actually erased? Might something truly strange have happened there? Logic asks us to simply believe that a wooden wall is simply more easily conquered than stone. Perhaps it is as easy. But first, consider any exception to how we believe the universe behaves. What about the vanishing house in Bachelor’s Grove Cemetery? The strange noises and unsettling frequencies that mimic hauntings? Or perhaps the disappearances of whole people groups? There might be a mundane explanation for each and every example. But what if there wasn’t? What if the universe utterly refused to play by the rules that we decided must apply? It’s a truly interesting question, indeed. Can strange activity in abandoned places truly be ghosts, or is our universe proving to be just that much stranger? First you see it, then you don’t, as we head north to Chicago for a visit Bachelors Grove Cemetery. Haunted graveyards are the grizzled old veterans of the ghost story and urban legend world. Many a tale of ghostly women and phantom lights persist, stemming from cemeteries often abandoned save for those visitors drawn by the historical significance of such places. (I wrote once before on one cemetery in particular, to pass along an experience from a reader, in this post. In addition, I’ve expressed my beliefs and hesitations on “haunted” places here and here. I believe providing this information to you, the readers, gets things out in the open and lets you know that this site isn’t only dedicated to ghost stories. So why write about a haunted cemetery? Cemeteries are places that are, by nature, quiet. And they should be. Cemeteries are meant to be places where people might feel comfortable laying loved ones to rest. Places where one can return to visit for peaceful reflection, maybe to remember the times when a family member or friend was still among the living. But often, as family lines fade away, or generations forget the wearing names carved into granite, the greenery encroaches, and drooping headstones become little more than scenery. In a place so quiet, stories can spawn from anything less than silent, anything that seems out of the ordinary. The shadow from a branch waving in the sun might evolve into a woman who wanders in mourning, a hundred years past the point at which she should have stopped. Another brave soul, just hidden from view by a thicket of trees and the shadow of night and the fact that both parties are trespassing might be mistaken as some ghostly visitor. The white lady (or “white madonna”); she walks the grounds during a full moon while carrying an infant. Phantom farmhouse; a ghostly farmhouse which is purported to shimmer, float, and then vanish, mostly reported during the 1950s. There are also reports by witnesses of the house shrinking as they approach it, then disappearing altogether. A Farmer and his plow-horse; both victims of a plowing accident—having been dragged to their deaths into the nearby slough. A two-headed ghost; near the same slough. Religious monks; as late as 1984 witnesses reported seeing multiple figures dressed in monk’s robes emerging throughout the cemetery. A black dog; witnesses in the 1990s reported seeing this manifestation at the cemetery’s entrance. It would disappear when they approached it. The “Woman sitting on the Grave;” a notable photograph which ran in the Chicago Sun-Times, purportedly showing a transparent woman sitting on a tombstone; the apparition was not apparent at the time the photograph was shot. Women in white, unfinished business, and mysterious photographs. While intriguing, tales of this sort aren’t unique to Bachelor’s Grove. The house, however, seems to be, somewhat. In fact, though I was able to find other tales of disappearing buildings (here, for example) it’s truly not something I’d heard of before, other than in the story of Seven Bridges Road. Read the comments on that one, though. It seems to have a rational explanation. Not featured among what I’ve copied above is another feature of this odd dwelling. The house, in fact, may be a trap for anyone who is able to reach it, open the door, and enter. Beware, for you may end up trapped forever. Don’t worry, though. No one’s actually ever reached the house. It always vanishes, unfindable and unreachable for anyone who’s trying. Funny thing is, my personal beliefs lead me to the conclusion that the phantom house of Bachelor’s Grove Cemetery has a logical explanation, because our universe is not a logical place as we see it. Something is obviously going on here, but what? And what about the dog, which no longer appears, or the monks, treading on ground that has never featured a church or monestery? Are they truly phantoms, or just the rules of the universe being broken? What’s going on that we can’t see? I find myself quite unsatisfied, once again, because Bachelor’s Grove Cemetery and the ground it inhabits doesn’t appear to be abiding by the normal rules of how a universe should operate. Find out more on Bachelor’s Grove Cemetery by starting at this link. Is there a good explanation for the way they rise into the sky, or do the years of sightings point to a deeper reason? Westward bound, yet again, for Brown Mountain, and the lights named for them. To be honest, I debated whether I should bother covering this topic, since it’s been done probably countless times before, in its status as a staple NC happening. It is, however, a part of the weird folklore in North Carolina and the world. I felt it deserved a place in the admittedly random and disjointed narrative that I’ve tried to make here. If you haven’t heard of what exactly the Brown Mountain Lights are, I’ll cover that, because knowing what exactly goes on is necessary to really examining them. On very dark nights, with all headlights and flashlights and lanterns covered or cut off, the lights will appear. First they slide into view, and begin to move upward, into the sky, where they hover. As captivating as the Brown Mountain lights are to people, how they work is very simple. They come from no visible origin, rise up slowly, and then they’re gone. It’s a nice, spooky story. Legends of their origins abound. The one I heard from my dad was that the lights were lanterns in a desperate search by the wives of dead warriors, still without closure so many years later. And of course, there are legends of fierce battles and people long before us and long gone now. Perhaps, some believe, they are UFOs, the nature of which may be completely alien (since, of course, “UFO” does not necessarily mean extraterrestrial, despite having that connotation). There is a movie, Alien Abduction, that follows that story exactly. Skeptical explanations are sure to follow. Cars, trains, some perfectly regular, normal cause, all of which are logical, and may be true. Whether the lights are mourning ghosts, the oddest aliens in the universe, or just evidence of humanity, the reality is that they’re there, and no one has definitively explained them yet, to my knowledge. Figuring it out is a fun mystery, and they could probably be called a “must see” if you’re in the area. A cool story, maybe nothing more. But I’m not really satisfied with that. The Brown Mountain lights are almost teasing us. Taunting us to come closer and really figure them out. Maybe, one day, someone will. Glowing eyes piercing through the dim haze of a foggy night…. Is is paranormal activity, or is the explanaton even stranger? Urban legends can begin as truth or nightmare. They may either grow from an actual occurrence and become more nightmarish, or begin themselves as nightmares made up to scare friends or explain away impropriety. Regardless of their origin, the most memorable stories make deep roots and stick around until they become an ingrained part of our culture, a source of paranoia about government activity or the guarded glances you cast over your shoulder on a night-darkened street. They are fuel for our imaginations. But what if everything you ever heard about the Mothman was true…in a way? The story of the Mothman is arguably one of the most famous tales to come from the state of West Virginia, and its details are simple. The story begins in 1966, in a graveyard. The harsh truth of life is that sometimes, there are graves to be dug, and someone has to dig them. This particular grave was being worked on by five people who were much surprised to see a giant man lift off and fly away. It most definitely was not the last time that anyone would see the Mothman, and for the next year, more sightings would come, all centered around the town of Point Pleasant. They were always much the same. A large winged humanoid flying through the night sky, eyes aglow, often red, and terrifying. Some dismissed it as a bird, while others embraced it as a sign of something supernatural, or alien. The sightings ended, apparently, when the Silver Bridge collapsed a little over a year after the first time the Mothman made his appearance. It was December 15, 1967, and a total of 46 people died. After that, no one said much more about the Mothman, for good reason. John Keel wrote a book about it, 1975’s The Mothman Prophecies. A connection was established between the bridge’s collapse and the appearance of this creature. Perhaps he was a warning? Another famous figure with glowing eyes is Spring-heeled Jack. Jack first appeared in London in 1837, amid already existing stories of street hauntings there. The first time he showed up, he jumped out of an alley and attacked a girl by the name of Mary Stevens. The next time, he ran in front of a carriage, caused it to crash, and jumped away, over a wall, laughing. He was said to have claws, the jumping gave him his nickname, and later accounts would give him glowing red eyes. Though he is linked so firmly with England, Spring Heeled Jack has been spotted in New Mexico. Some versions of him breathe fire, and he still attacks people, and still jumps away, scaling seemingly impossible heights very quickly. He was last seen in 2012. The last on our list of strange-eyed folk are the Loveland Frogmen. It was the middle of the night, summer 1955. The person who first saw the creatures is to this day unknown. As the story goes, he was driving along this particularly dark stretch of road when he saw, off to the side, a few creatures, roughly 3 or 4 feet tall, standing. Watching. The creatures are described as having skin like a frog, big eyes, wide faces, and, instead of hair, scalp wrinkles. I imagine they must have looked eerie, because a human’s eyes don’t reflect light like an animal’s. So who were these guys? The Mothman, Spring-heeled Jack, and the Frogmen? Just stories, embellishments on real people with a little shared nightmare thrown in? The eyes are the key. Might they have something to do with the mysterious Moon-eyed people? This group was said to see better at night. It might follow, then, that their eyes were reflective. We still have no idea where they might have come from. But the Mothman, Spring-heeled Jack, and the Frogmen might have an origin even odder than any of us can imagine.